Notebooks are gradually becoming consumer electronics. What does it mean? In my opinion, customers now pay much less attention to technical features of a model (especially as the choice is not wide). Exterior is becoming one of the main motives. 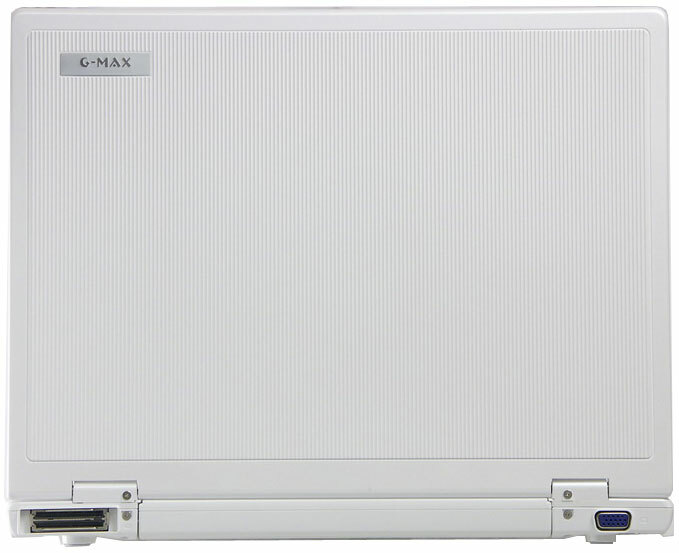 The white notebook from Gigabyte looks advantageous from this point of view. 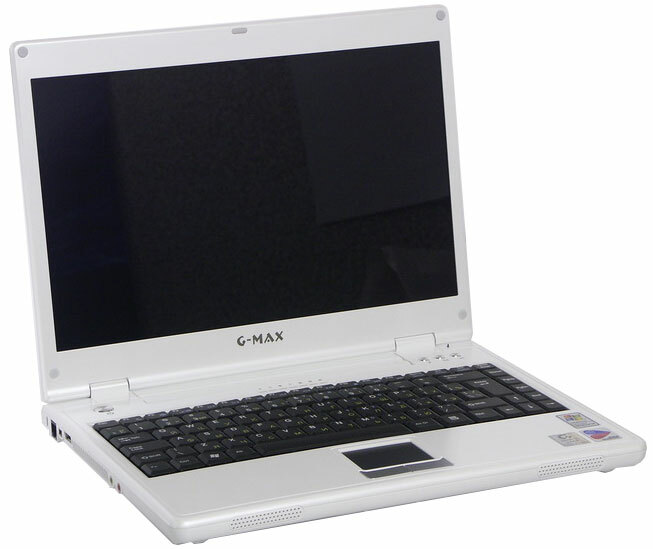 In fact, these are standard characteristics, except for few USB ports, no video-out and PC Card slot. There seems to be a tendency to omit this expansion slot. It's hard to judge how justified it is, because I don't use such cards. It seems to me that practically all necessary interfaces are already integrated into notebooks these days, so that PC Card slot can really be used either as a card reader or to install a Wi-Fi card (if there is no built-in solution). 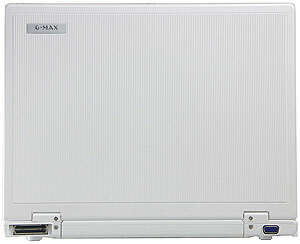 G-MAX N411 resembles Acer TravelMate 3200 in its exterior. It has a strict design, the notebook looks like an expensive portfolio. The model stands out against other notebooks thanks to its snow white color in the first place. Most of the notebook's rear is occupied by a battery. A docking connector and a video out, covered by white plastic lids, are at the sides. The lids hold tight, but they are not attached to the notebook when you remove them, so there is some risk of losing them. 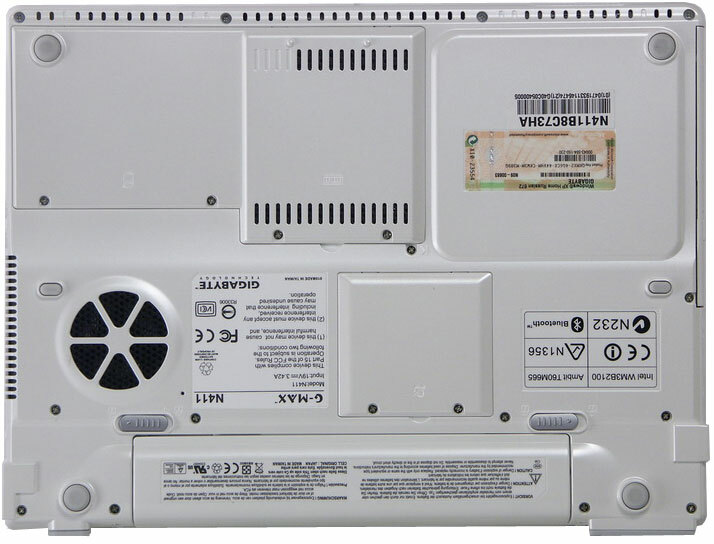 Unlike Acer, the front panel houses no buttons to switch on/off wireless interfaces, only speaker grids. There is also no display lid latch. 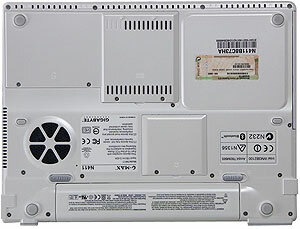 The bottom houses battery latches, HDD bay (see the photo - top left corner), mini PCI bay (above the battery), and memory bay (top center). The notebook looks striking when open. Aluminum keys and touchpad buttons contribute to its charm. Perhaps, the keyboard should have also been painted white, to preserve the style. It's very convenient to open the lid — when closed, the lid is safely fixed; you have to make an effort to open it. As I already wrote, it would be interesting to see the mechanism after a couple of years of intensive usage. A strong point for the keyboard is the large Enter key. On the other hand, its left Shift is short and the block of cursor keys is too close to the other keys. The touchpad is convenient, but there is no scroll button. 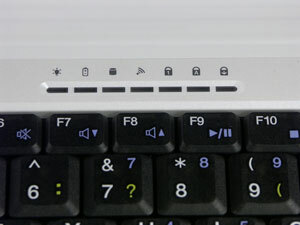 All indicators are located above the keyboard, it's impossible to get status of the notebook when the lid is closed. 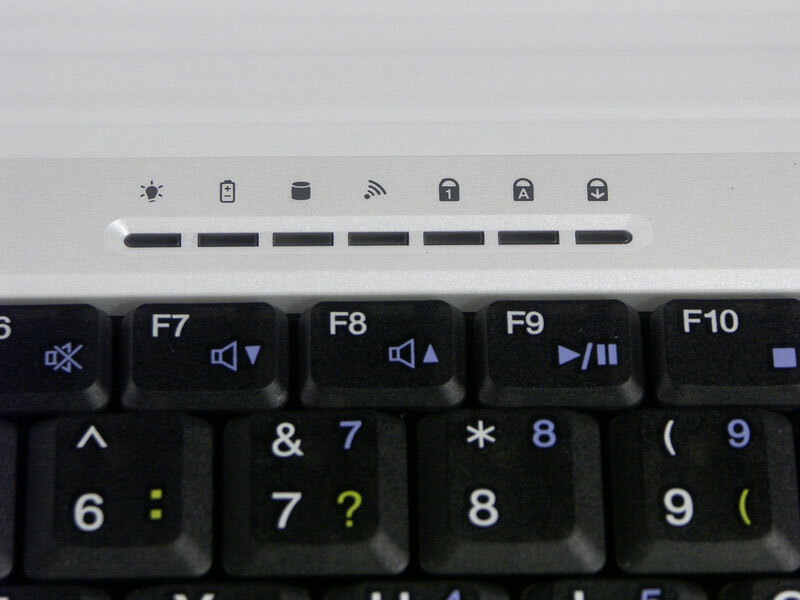 There is no button to disable a wireless network (you can do it by pressing Fn+F2), two application buttons launch an email client and a browser. Another button launches QuickOn-Music utility, which is used to play compact discs and MP3 files, recorded on an optical or hard disk (in C:\QuickOn-Music\) or on a USB drive. 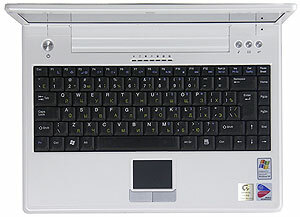 Playback is controlled from the keyboard. The panel produces a nice impression at first sight. Despite the fashionable "glassy" filming, there are few glares. You can look at the complete instrumental test results here, the main results are published in the table. min., % max., % CR Horiz. Vert. 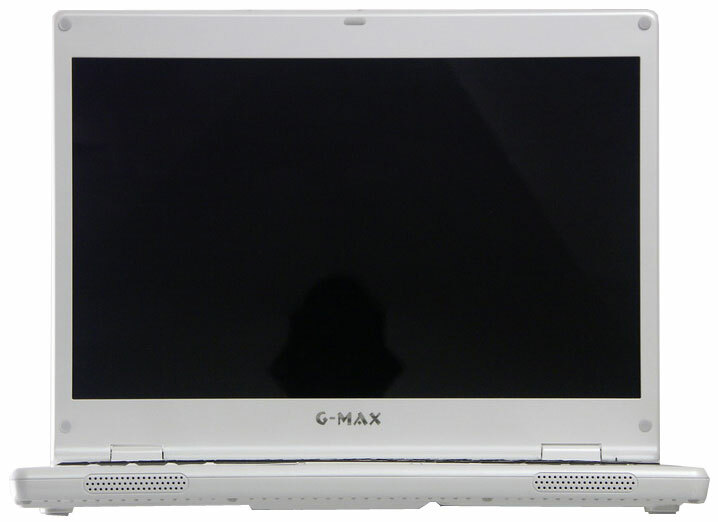 The matrix offers good response times, brightness and contrast are also normal. But the uniformity of lighting on the black image is a tad too high, bottom part of the panel is visibly lighter in dark scenes. Angles of view are not too wide, contrast drops drastically fast when you deviate vertically from the normal to the screen plane. What concerns heating, everything's standard here — the main source of the heat is a hard disk under your left palm. Gigabyte notebooks are backed up by 1 year of full warranty (6 months for a battery) plus two years of free repairs. The Russian web site of this company offers model descriptions, a library of BIOS, drivers, and user manuals. 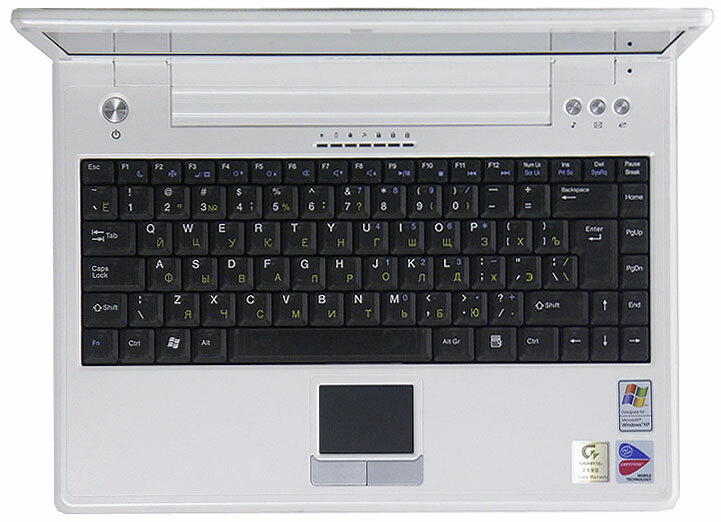 You cannot possibly expect anything new from the first generation Centrino notebook with a Dothan processor and integrated video. So I'll just publish the results. It's quite an attractive and not very heavy model. In my opinion, it's a good notebook for a business lady. The assemblage quality is good. The keyboard is not very convenient - that's probably the only ergonomic flaw. What concerns the matrix, its disadvantages are typical of nearly all models in this price range.